Most investors buy diversified dividend growth stocks so they can reinvest those dividends and hopefully live off the income stream generated by those dividends in retirement. Dividend investing has become even more important over the last few years in light of record low interest rates. And with low interest rates expected to be around for a long time, it’s imperative for investors to follow some basic rules for dividend investing. Here are our 10 rules for dividend investing. When it comes to dividend investing, the first thing most people look at it the dividend yield. After all, the higher the yield, the greater the payout. But there’s more to the dividend yield than meets the eye. Think you’ve located an undiscovered gem with a 20% dividend yield? Think again. With dividends, the higher the yield, the greater the risk. For buy-and-hold investors, the best approach to dividends is to choose quality over quantity. An excellent large cap stock that provides a four percent dividend yield is going to be better in the long run than a higher risk company with an eight percent dividend yield, shaky track record, and volatile share price. If you want to know the odds that the company you’re interested in is strong enough to maintain its annual dividend yield, look at its track record. Specifically, look for stocks that have not just paid an annual dividend for the last 25 years, but have also raised their annual dividend for as long. These companies are called “dividend aristocrats,” and they have outperformed the S&P 500 over the last 10 years by a wide margin. 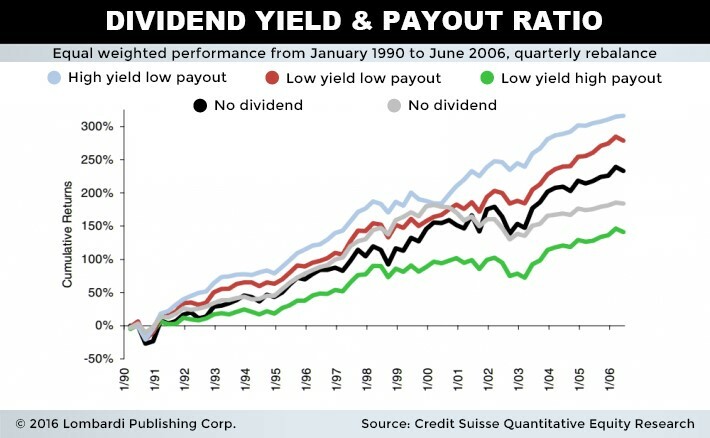 Raising their annual dividend yield for more than 25 years means that the company continues to make money no matter what the broader markets are doing: bear market, bull market, Great Recession, etc. Instead of focusing on the yield, focus on the dividend growth, which accelerates compound growth. 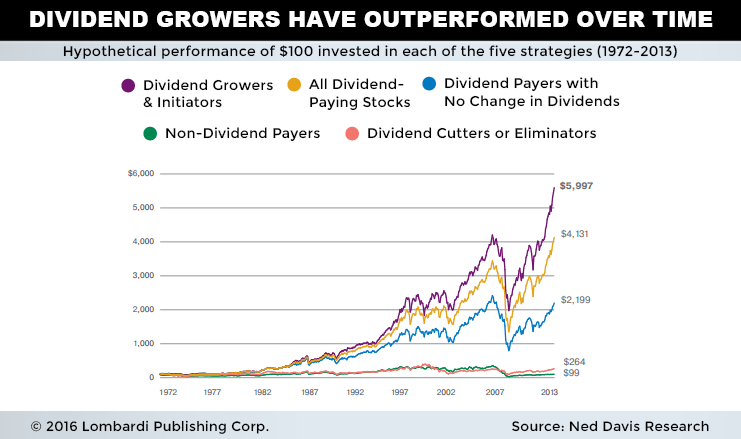 Dividend aristocrats are well-established, easily recognizable brands; paying a dividend and increasing the yield annually is part of the corporate culture, and they’re not going to want to ruin that winning streak. If a company is paying out all of its income as dividends, there is no margin of safety. It also means the company isn’t reinvesting any of that money back into its business to ensure its growth. If a company’s operations are not solid and it runs into trouble or the economy sours, the first thing to get cut or eliminated is the dividend—and along with the dividend yield goes the share price. That’s why it’s important to have a solid understanding of the company’s financial strength. Pay close attention to the company’s free cash flow; this is the amount of money left over after capital expenditures. Another important rule for dividend investing is to pay attention to the dividend payout ratio. While the free cash flow shows you how much money a company has, the dividend payout ratio tells you what percentage of earning is being paid out to shareholders. What’s left over is called the “retained earnings” and can be used to reinvest in the company, pay off debt, or sock away. To determine the dividend payout ratio, divide the annual dividend by earnings per share (EPS). A ratio over 100% means the company is paying out out more than it is taking in. The dividend payout ratio is not application to real estate investment trusts (REITs) or master limited partnerships (MLPs), as they legally have to distribute at least 90% of their earnings to shareholders. It might be tempting to take the quarterly, or in some cases monthly, dividend payouts, but if you’re thinking about saving for retirement and generating a regular income stream, you need to reinvest all your dividends. Not only will this help you buy additional shares, but over time, the compounding returns will make a serious difference to your portfolio. 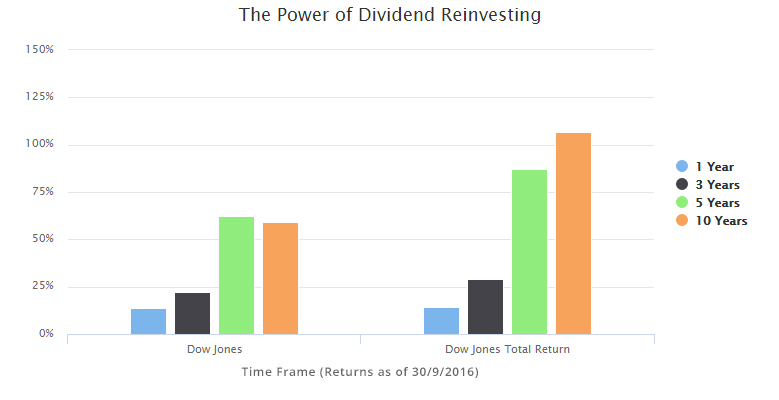 The chart below juxtaposes the performance of the Dow Jones Industrial Average versus the Dow Jones Industrial Average Total Return (all dividends reinvested). You can clearly see the benefits to reinvesting your dividends. Taking advantage of a company’s dividend reinvestment program (DRIP) and direct stock purchase plan (DSPP) is one of the most important commandments for dividend investing. Most, if not all, dividend aristocrats (and a large number of other dividend-paying stocks) provide investors with a DRIP and DSPP. These give shareholders the option of reinvesting their dividends, as well as making voluntary cash purchases of additional shares (whole or fractional) without paying processing fees or service charges and without the need of using—and paying for—a broker. Some companies even provide a discount on shares purchased through their programs. Some investors like to concentrate their assets on a handful of specific sectors. If the sector you chose is doing well, this bodes well for future dividend earnings and growth. If, however, the markets turn or the sector faces unexpected headwinds, this could be an issue for both dividend growth and capital appreciation. Spreading equities over multiple sectors adds diversity to your holdings and minimizes risk. In my view, this is the most important rule for dividend investing. Dividends are an important aspect of investing—who doesn’t love free money?—but dividends are not the only metric to consider. A fundamental analysis looks at a company’s financial statements like revenue, earnings growth, and profits to predict a trend. A technical analysis will mean looking at chart patterns, such as price action and past price performance, to help predict the health of the company. A high-yield growth dividend stock may be appealing, but investors cannot live on yield alone. A company’s dividend is only as strong as the company itself. Do your due diligence. Make sure you understand the company and its financials. Lastly, another important rule for dividend investing is cutting your losses. If you’re a billionaire investor like Warren Buffett, you can live by the mantra, “our favorite holding pattern is forever,” but most investors can’t. Investing in high-yield dividend growth stocks is no different than investing in any other stock. Know when to cut your losses. It isn’t worth keeping your money in a losing stock just so you can collect a dividend. Your money can go to better use elsewhere.